Girl and the Goat is one of the ‘IT’ restaurants in Chicago. 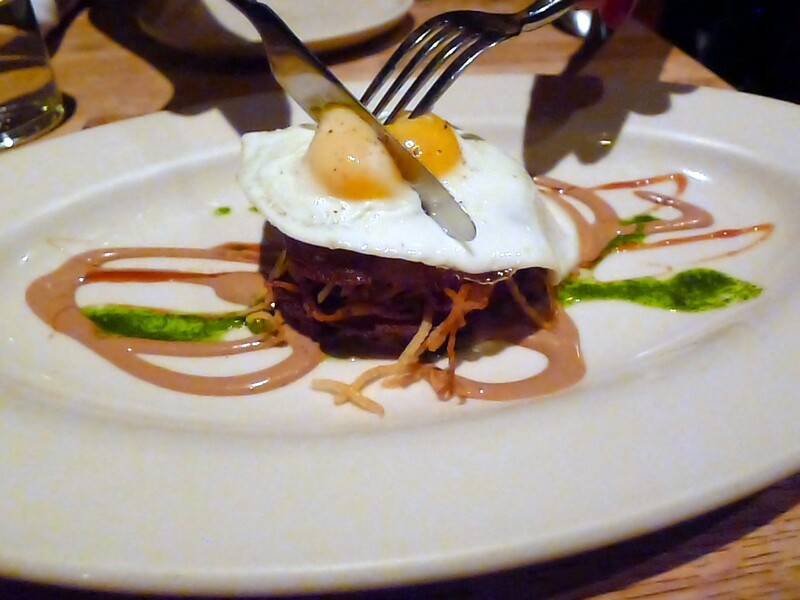 A laudable hotspot on the Chicago culinary scene, it is run by Executive Chef Stephanie Izard who came to prominence when she won the 2007 series of the hit cooking show Top Chef on the Bravo channel. For two years after the win Stephanie travelled, speaking, cooking and promoting her project which was to become Girl and the Goat. When Girl and the Goat opened in 2010 it immediately received widespread recognition with Izard being named Food & Wine’s Best New Chef. Located in the West Loop of Chicago, Girl and the Goat sits on trendy West Randolph Street and is suitably fitted with a look of urban chic. The restaurant is a quasi-namesake for Izard, which is French for a breed of Pyrenean goat. 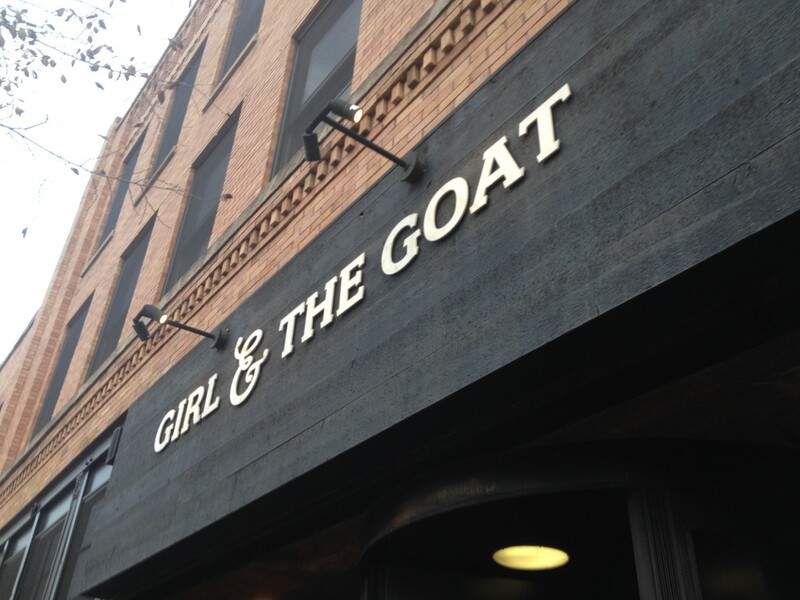 The buzz for Girl and the Goat hasn’t abated since it’s opening with reservations being very difficult to come by. 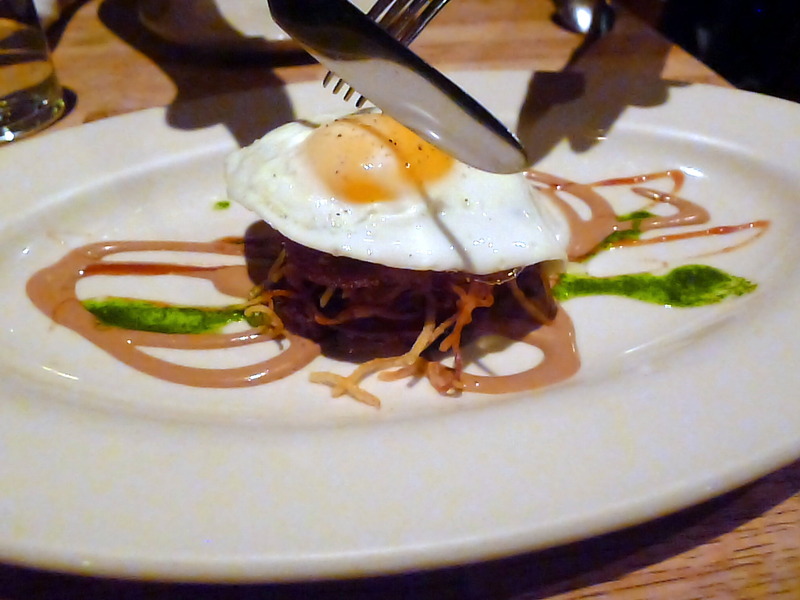 But the restaurant also operates a walk-in policy with a waitlist for the table seats on a first-in-first-serve basis. There are also some lounge or bar seats that diners can simply walk in and grab. There are no waitlists for these and so you just have to be diligent and take one when they become available. We were witness to certain disagreements between parties about who got there first, and in my humble opinion, operating a waitlist for these seats would have helped to keep the peace. We didn’t have a reservation but managed to secure some lounge seats at about 5.45pm where we started to eat while we waited for a table. The lounge area is quite a socialable place to hang out as you get the chance to chat to other diners and people watch. Moving to a table later on the evening, we liked the tightness of the seating arrangements much less. Also as a table became free, the restaurant insisted that we move immediately even though we had just started eating our second dish. We didn’t understand why we couldn’t have finished the plate of food before moving, but the restaurant seems to have a very in flexible policy on such matters. Girl and the Goat offers an eclectic selection of dishes, hopping from Italian inspirations such as pasta, drawing from Hispanic ingredients such as Cubano pork and tomatillo, and integrating Asian flavours such as miso and tamarind. The menu is divided between vegetable, fish, meat, and goat, and was an incredibly interesting and difficult one to choose from as it was so captivating. It is a sharing menu and we dipped from section to section, trying some escargot ravioli (fish section) with bacon and a tamarind-miso sauce ($15). As a pasta filling, the escargot was a little bland. But the pasta itself was well made, and the sauce was deliciously sweet and savoury if a little over seasoned. The bacon in the sauce also helped to bring the dish together nicely. 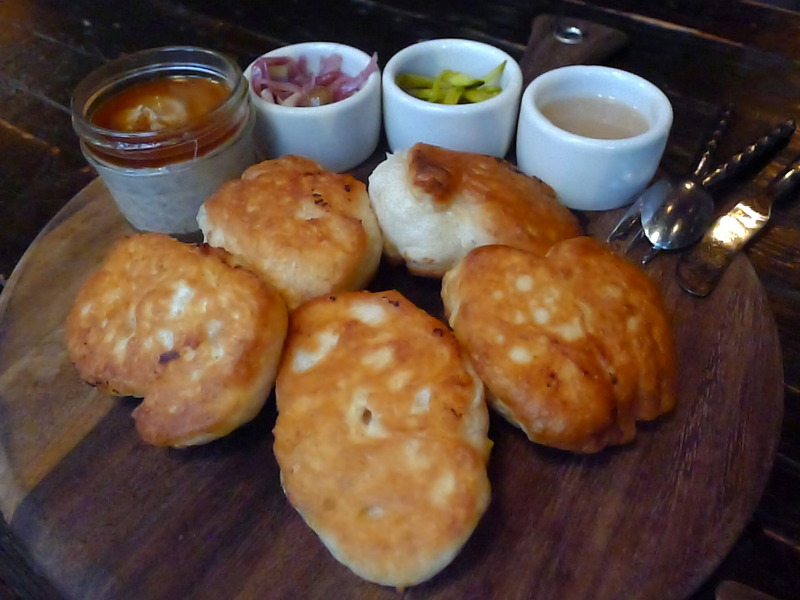 Goat liver mousse (goat section) was served with a delicious batch of warm, soft and gently toasted crumpets ($14). The crumpets were excellent, and the mousse itself was creamy and well made. As a liver, the goat wasn’t as tasty as that of goose, but proved particularly satisfying with the accompaniments of some tangy pickled vegetables and a scrumptious apple butter. 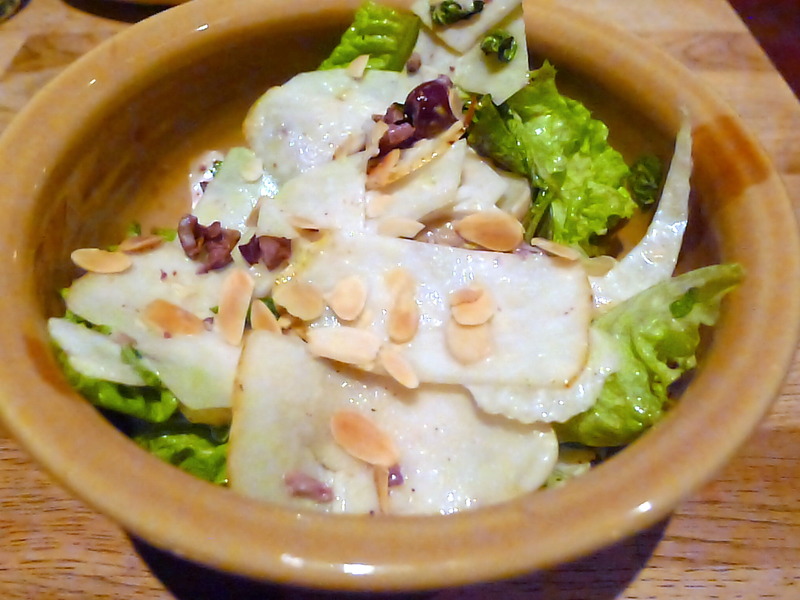 Kohlrabi salad (vegetable section) with fennel, toasted almonds, bartlett pears, roasted shiitake and lettuce ($9) was a delightful collection of of ingredients with the almonds adding crunchiness and the pears providing sweetness. There was ginger running through the dressing which was zesty and appetising, but the salad leaves had started to go limp and this disappointed. 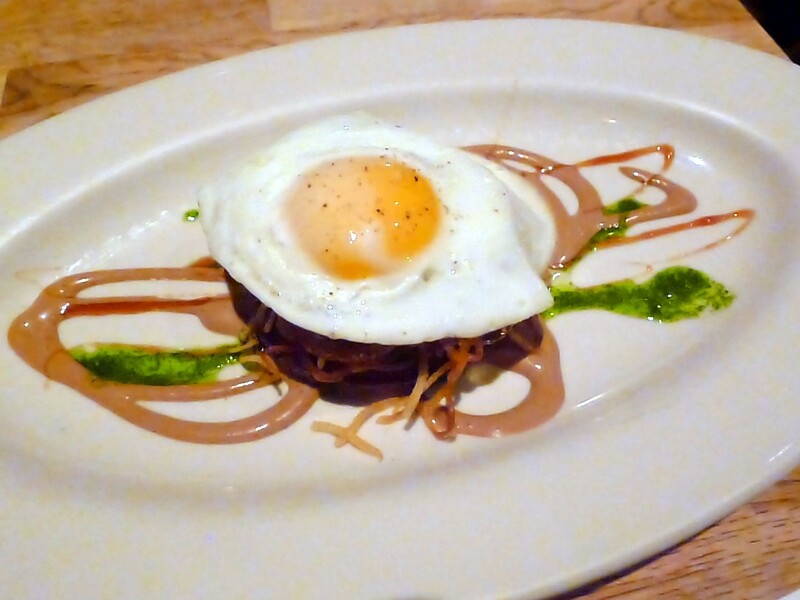 Wood oven roasted pig face ($16 – meat section) consisted of slices of meat from the pig’s head rolled into a torchon, roasted, sliced and then pan-fried, and then served with a sunny side egg, a tamarind sauce, cilantro, red wine maple syrup. The meat was fabulous – moist and tasty with a slight crispiness to it. The tamarind sauce was glorious and all the flavours of the dish worked together beautifully. 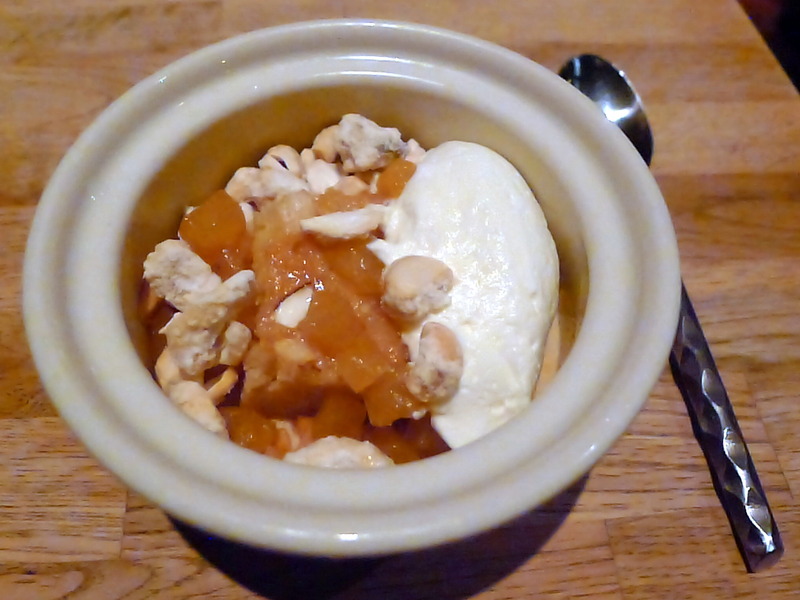 To dessert, and a miso-butterscotch budino ($8), a cashew cake filled with bacon toffee and topped with glazed pineapple, candied cashews and whipped cream was the epitome of heaven. This was a spectacular dessert. The cake was magically light, decadently enhanced by the not-too-salty bacon toffee and the natural sweetness of the pineapple. 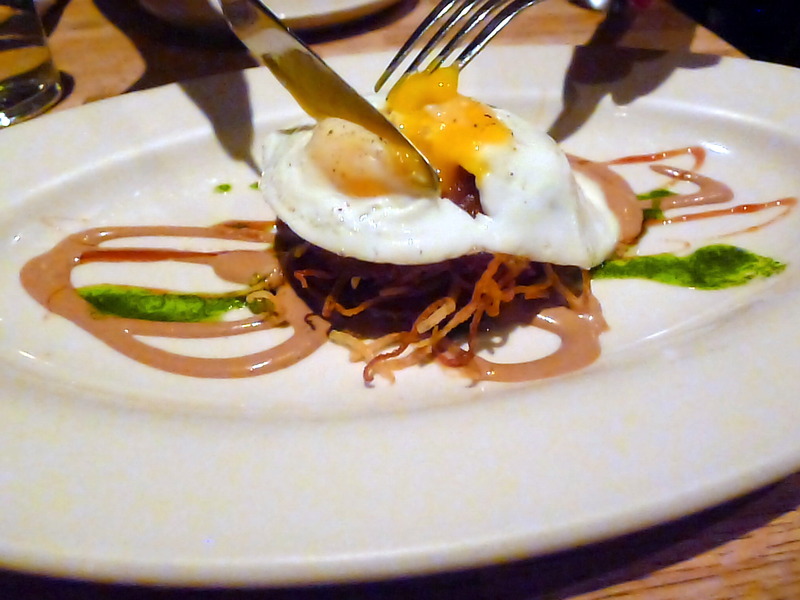 The menu at Girl and the Goat was impressively original, creative and uniquely that of Stephanie Izard’s. Somehow she has managed to make the integration of the various international influences that she draws upon come together in a synchronised harmony of flavours. The food was impressive, but what disappointed was the inflexibility of the restaurant, which extended from the table moving incident to the restaurant almost insisting that we leave when we finished our meal, even though we had 15 minutes left on our table. Some of the staff that served us also appeared despondent and uninterested. Seemingly Izard does not run a happy household. 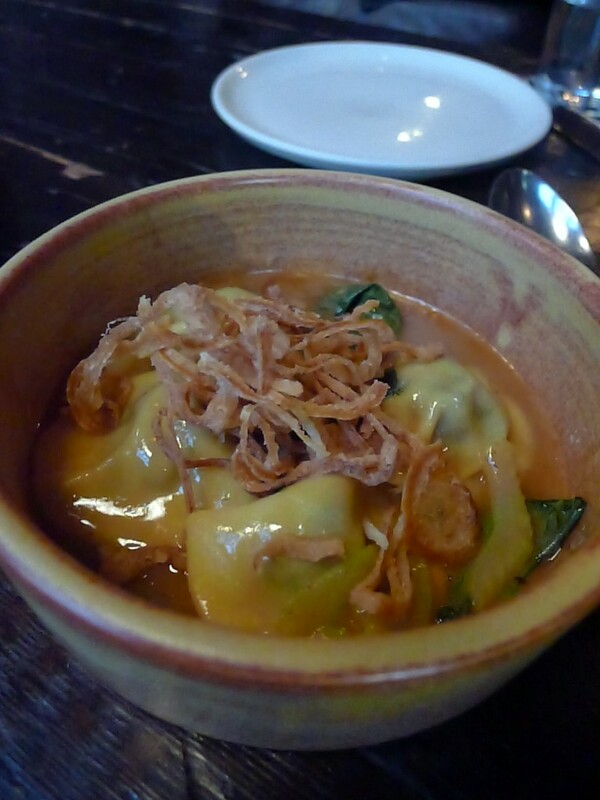 I enjoyed the food but would prefer not to endure the experience of dining at Girl and the Goat again. Prices: About $32 to $52 for five plates to share plus a dessert each. Excludes drinks, taxes and service.